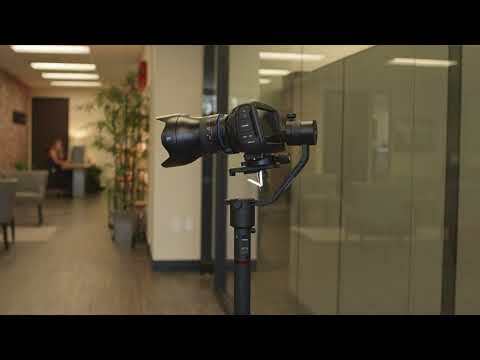 Blackmagic Forum • View topic - Best gimbal for the BMPCC4K ? Best gimbal for the BMPCC4K ? Thank you for your opinions and your experience. 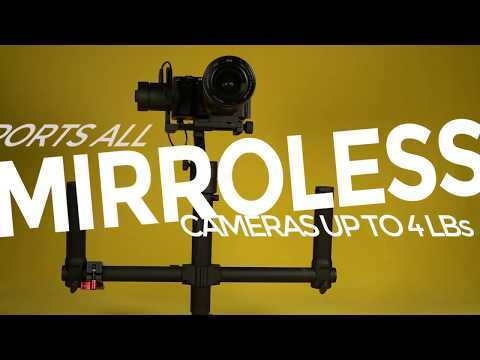 Re: Best gimbal for the BMPCC4K ? Josh, that Tom Antos review is quite good and great to see the Ronin S at the same time. Most shots I liked the Moza better those few times there was a difference in the images. However the criticism beginning after 15’ are serious in terms of the sound that might be made by the plastic portion of the Miss grip. So it will need some practice hopefully to avoid handling it in a way that makes a sound that might be picked up on the audio track. Another reason for not using the on-board mics. What about the Moza Air Cross? rick.lang wrote: Most shots I liked the Moza better those few times there was a difference in the images. With so many uncontrolled factors it's hard to say one's better than the other, but the running shot with Moza had the kind of micro jitters which occur when the camera platform is vibrating, from strain of some sort. Could be an adjustment error, but some combinations and angles produce that disturbance, there may be no ready cure, except avoiding them. Yes, neither solution seemed flawless, but I suppose some allowance may be given considering the price. And experience in use and tuning the settings may also contribute to a better result. The sensitivity thumb wheel appealed to me. John, the shots where the operator was walking backwards and trying to frame in close on the walking subject didn’t seem the best way to do that as the walking subjects become an irritating bobble head. That macro mess bothered me more than the running micro jitters. I wonder if that shot would look better as a closeup only where the actor is wearing the stabilizer with the camera pointing back to the subject. What do you think? I think the main problem with the backwards shot was (first of all) the difficulty of moving backwards and doing the "walk", though neither of them were grand masters forward, either (it ain't easy). I would have tried locking the gimbal backwards on the subject , and walking forward instead, trying to keep an eye on it at the same time. The other issue is (if I remember rightly) he used a long lens for that close walking shot, which of course exaggerates every disturbance. Keep it wide.... Some people even suggest increasing the frame rate slightly. But the jitter thing will make the footage unusable. You'd need to do *something* about it. A stabilized lens might fix it -- or might not. Kays, not even looking at the feature set, I’d be cautious buying a gimbal with a 4 pound payload. I just think it would be too limiting. You spend a bit more for the Air 2 that handles 4 Kg and can still see imperfections in the Tom Antos review. Of course, I’m happy if someone buys it and proves my concern is ill-founded. Can someone post examples of something working better? I mean any combination of camera and gimbal, provided there's no live image stabilization (lens/body) or post stabilization. I know gimbals have their limitations as opposed to a steadicam, so since people are saying this is bad stabilization, I'd like to see what is supposedly better with similar focal lengths without electronic image stabilization. Genuine question. I've seen impressive one-handed gimbal footage twice -- so much so, it didn't strike me as credible. As it turned out, the operator was standing on some kind motorized vehicle and the other was with a GH5 with lens and body stabilization, or so they claimed. There's a guy on youtube, Brandon Li, who knows how to move, which is 90% of the battle. But even he doesn't post the kind of shots which reveal the flaws. He shoots in open areas or close on the subject, so you don't see everything around the subject bobbing and bouncing. With this technology, you want as much help as you can get, which means you definitely benefit from OIS. In post, there's not much you can do to correct the flaws. I read a lot of online reviews before choosing the original Moza Air for my original Pocket camera. The first day I had it I struggled to get smooth looking footage. I thought, no problem, operator error. The second day my Moza Air started acting erratically. By the end of the second day the Moza Air wouldn't even recenter itself and became unusable. I took it back to the (large) dealer and asked for a tech to check it out, make sure I wasn't doing anything wrong. The tech came out to reception, said he wasn't even going to test the Moza. Said he was constantly dealing with Moza Air issues and wished his company no longer distributed it. He offered me an instant swap for a brand new Zhiyun Crane, with money back. I took it. Day one with Zhiyun gave me stable footage, and I've never looked back. This is just my personal feedback, and obviously people on the web generally give Moza products a good review. I'm going to try my Crane with my (just received) BMPCC4K, and if I can't get it to fit or balance, I will look at other options, but not Moza. It’s possible problems like Chris experienced have been addressed in the Moza Air 2, but companies are loathe to admit to problems that are related to hardware if that was a major part of the problem. Chris Whitten wrote: I read a lot of online reviews before choosing the original Moza Air for my original Pocket camera. Moza Air had some issues just like some Blackmagic cameras do when they first ship. With firmware updates things got much better. I've used the Moza Air with the original BMPCC with Metabones Speedbooster and Sigma 18-35. I've already seen one demo of it with the 4k (I don't have yet) done a few months back and there seems to be enough clearance with a plate mounted to shift it off side a bit (as I see being done with other gimbals as well). I've been very happy with Moza Air. Best support moment was when I too had an issue in the early days and they video Skyped me at 4am from China so I could show them the issue and they could duplicate it on their end with my confirmation. Issue fixed in the next firmware update. A lot of people don't seem to be aware of FeiyuTech gimbals (https://www.feiyu-tech.com/ak4000/), or dismiss them outright because they aren't as popular. I have one of the original FeiyuTech a2000 models that takes up to 2.5kg and it's not a bad gimbal at all. The newer models in the link appear to be quite good and are usually better priced than the more popular brands. Craig Seeman wrote: Issue fixed in the next firmware update. Mine was an issue with the motors. You couldn't fix it with firmware. And my set up was extremely flight, with the original pocket and tiny wide angle lens. If it could be fixed with a software update I'm sure the main UK dealer wouldn't have swapped the Moza without even looking at it. I didn't get very good results with the Ronin S and Sigma 18-35mm lenses. I got better results with olympus 12-40mm lens. But still not perfect. Not very good when shooting in 25 frames. There's no problem in 60 frames. It's not surprising 60fps is smoother than 25p, but what exactly is happening at 25fps? This technology is relatively new, so complaints don't often distinguish between the limitations of gimbals, the limitations of the operator and actual performance defects which could be corrected. pulalis wrote: I didn't get very good results with the Ronin S and Sigma 18-35mm lenses. What's your setup like? What is preventing you from achieving balance? And: how much imbalance have you got? What does the app say? How much power is used on the axis at "rest"? There is no problem to set up. Camera balanced well in ever angle on Ronin. But when is starts to record it's swinging right to left and left to right. I changed motors hard settings automatically and manually . But result is not good. By the way i am not new user of gimbal. I used to work different gimbals and cameras. pulalis wrote: Camera balanced well in ever angle on Ronin. But when is starts to record it's swinging right to left and left to right. I changed motors hard settings automatically and manually . But result is not good.. Sounds really strange. And this only happens with the 18-35? I've had anything from just a XC-10 to my 1Dx mkII with pretty heavy glass on mine and never had to do anything but 'auto tune' between cameras. Don't you feel that something might be broken/not working correctly? Swaying side to side isn't uncommon, particularly with long, heavy lenses. You'll likely see somewhat better performance when the gimbal is locked (not "follow" mode). What about the Moza Air? It was a new design just over a year ago and is 1/3rd less expensive than the Air2. It also has a two-handed grip. I had a fore-arm brace for my Glidecam 4000. Are they handheld all the time? Don't they get heavy? John Paines wrote: Swaying side to side isn't uncommon, particularly with long, heavy lenses. You'll likely see somewhat better performance when the gimbal is locked (not "follow" mode). Now I'm curious... I'm not familiar with this phenomenon. What axis is acting up, when you say "swaying side to side"? DavidNJ wrote: What about the Moza Air? It was a new design just over a year ago and is 1/3rd less expensive than the Air2. It also has a two-handed grip. B&H gave me an analysis on this. It appears the Air needs the camera shifted to the left to clear the right side. B&H recommended a cheese plate rather than using an offset Arca Swiss mount in an Internet video. They said flipping the tilt motor to the left side was not a good idea because the electronics may get confused. I got the Moza air with dual handles and the legs for $350. The net is any alternative will be 50% to 100% more. The cheese plate adds less than $20. 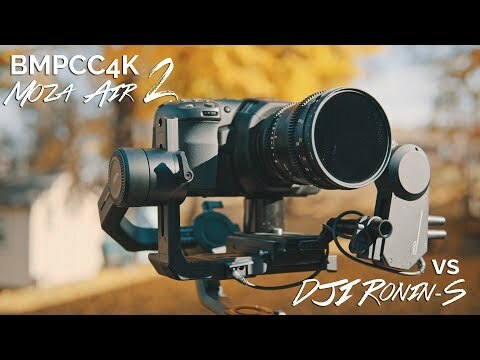 Gimbal Guru posted a video on balancing the BMPCC4K on the original Moza Air. They note the issue with the adjustment knob on the plate so the B&H advice is probably good. The Air certainly seems to be capable though and they show it with the added weight of a Metabones Speedbooster. The zhinyun app controls both the focus and zoom servos. I'm waiting for its release to see how well it works. The moza air x will have a similar operation as far as I read somewhere. Do you checked out the Weebill LAB? In my point of view, payload should be enough and it is a really small gimbal. I'm looking for a small setup. Maybe the Weebill LAB looks like the smallest gimbal for bmpcc4k. But right now, no experience seen. Only a small number of YouTube videos. But maybe not with latest firmware. Do you checked out the Weebill LAB? In my point of view, payload should be enough and it is a really small gimbal. No The weebill lab cannot balance the camera. I have contacted zhiyun and some users they have told me that it wont work. There is also a "moza air x" that should be out in a couple of months it has a handle similar the the crane but offers more capabilities. It's blue tooth capable. I have some vintage wide angle lenses that also have long barrels. They are very small and light, but the long barrel introduces movement even on a powerful gimbal. The longer barrel lenses are not as steady as the short modern wides. I'm talking micro movements, not obvious swaying. But I found the most steady gimbal footage is with Olympus and SLR magic wides that have short barrels. Other short barrel lenses will be fine (Panasonic etc). I bought the Moza Air on the strength of that BMPCC4K video (and other reviews), but had to return it a couple of days later due to fatal motor failure. This was just with the previous (lightweight) Pocket and a pancake lens. You get what you pay for. So I finally managed to balance the sigma 18-35/metabones smallrig full cage ssd clamp combo. Drilled and tapped a 1/4" thread on the furthest hole from the clamp on the ssd holder. 100g counterweight on the 1/2" hole on the right hand side of the cage (with a stepdown 1/4" adaptor) Used the usb cable that came with the ssd. Everything is pretty much at the limit of adjustment, but it's balanced and it works. I'm getting a 12-40 this week that will be easier I'm sure but at least I have the option if I need to/ feel strong enough! 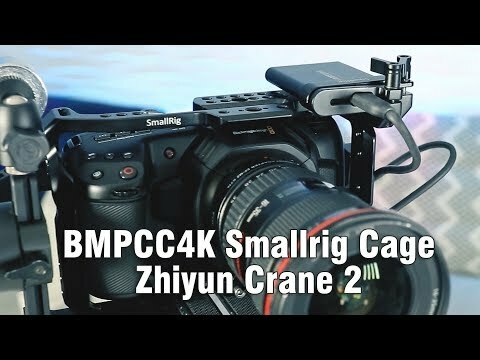 Has anyone rigged up the BMPCC 4k on the Zhiyun Crane v2? I am looking at using the BMPCC 4k rigged up for gimbal shots as a B-Cam alongside my URSA Mini and I wondered if the Zhiyun Crane V2 would have the payload to support it and or if it will balance correctly? Has anyone done this that can give me a bit of info? I'm only asking about this specific gimbal as this is the one I own. James Alexander Barnett wrote: Has anyone rigged up the BMPCC 4k on the Zhiyun Crane v2? You'd need a cheese or QR plate, since the camera's too wide to attach directly to the gimbal, and I don't think it could be balanced without counterweights, except perhaps with a feather-light lens, you'd need to experiment. Good shout John, you are probably correct, I am sure I have something here I could use to shift the weight around a bit and hopefully make it balance. Iain Titterington wrote: Everything is pretty much at the limit of adjustment, but it's balanced and it works. It would be possible and I think when the combo first came out that was tried. I'm hoping when my focus motor arrives that will be mounted to the right and will mean the side counterweight will not be necessary and thus I can use the half cage and then there will be plenty of room. As is I get 'excellent' test results on all axes when I run the App diagnostics so I'm sticking with this for now. I have mounted the gimbal on a Manfrotto baseplate so I can quickly switch between legs and monopod so the weight is not such an issue. Hopefully it will still possible to balance, will report back with results. I have a cheese plate and a Zhiyun counterweight. I must admit I made a quick first attempt, the camera fit OK with the cheese plate, but was still weighted too heavily to the front left to balance easily (with the counterweight screwed to the back right, near the motors). I didn't spend any time on it though, so I'll try again. So I managed to get it to balance using a Manfrotto quick release plate so the camera screen sits close to the roll motor, i managed to get it so it has enough clearance to tilt properly. The only problem as someone mentioned above is because of the battery grip design you can’t balance the roll axis properly as space is blocked but the tilt motor. To solve this I spun the camera plate so it effectively runs upside down and balances properly, the only downside with this is the tilt seems to stop when the camera is level and doesn’t give you a full range of motion, I guess the gimbal thinks it’s not in the correct orientation. One way to combat this is to adjust how you the hold the gimbal, bringing the bottom of the handle up to allow some range within the motor if that makes sense. Long story short if you can get a good balance the Zhiyun Crane V2 has more than enough power in the motors to work correctly. Guy is using same set up I have except I have not purchased the Crane 2 yet. The Canon 16-35mm is a tad lighter than the Sigma from what I recall. James Alexander Barnett wrote: So I managed to get it to balance using a Manfrotto quick release plate so the camera screen sits close to the roll motor, i managed to get it so it has enough clearance to tilt properly. I'm having a hard visualizing this arrangement. Any chance of a photo? That aside, are you really saying that you got good balance on all axes (motors off)? And good results operating? I know it was fairly confusing so here is a video I had put on Instagram. I used the setup today and to be honest the results weren’t perfect as there where slight vibrations, with a little warp stabilise in post it was fine but not ideal. I think the problem comes with the lens choice, I had my 24-105 rigged with a viltrox EF adapter, I think it you had a native M43 lens that was a little lighter it would help the gimbal be more stable. Here is the video I posted.